Here is a list of our favorite websites, books, weather aps, sailors, etc. It is a working list, and constantly changing. We have so many favorites and learned from great people, websites, programs, and books. But we haven’t had time to put them all up, or add all their links. We will keep working on it. Keep checking back! Eldridge Tide and Pilot Book – You’ll need a tide and current reference aboard. I find Eldridge’s to be easy to use and informative. Eldridge’s is only an East Coast reference. Dutton’s Nautical Navigation – Don’t be nervous by the size of this book. Its absolutely fascinating and having a solid knowledge of traditional navigation doesn’t only help you find your way. Practicing traditional navigation enhances the entire experience at sea. Oceanography: An Invitation to Marine Science – One of the wonderful things about sailing is experiencing the ocean first hand. But understanding your environment makes it all the more beautiful and interesting. Perhaps you’ve seen some of my Sea Science articles in SAIL magazine. This oceanography textbook is a great read on a calm passage. You’ll want to read it cover to cover! One Simple Question …nudge nudge, wink wink! Monitor Wind-Vane I would never sail offshore without one! Honestly. You won’t regret it. When we were sailing solo, the Monitor Wind-Vane was our #1 piece of gear and our first mate. Portland Pudgy – by for the BEST dinghy ever, and our favorite and most used piece of equipment. It is well worth the investment. I can’t say enough about it. Just ask us why we love it! 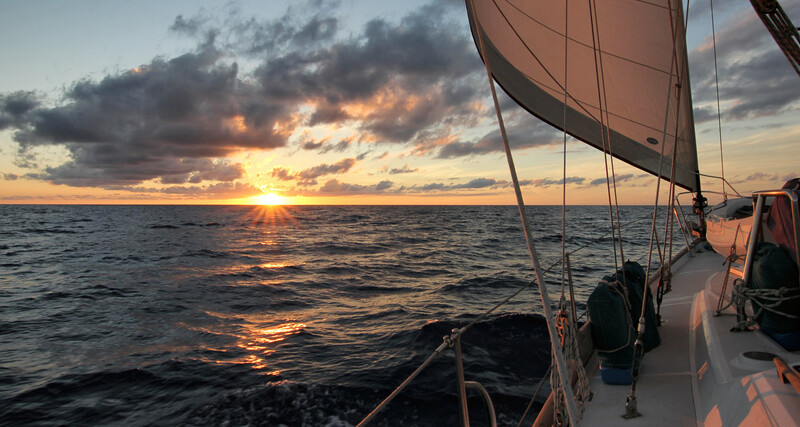 John Neil offers offshore sail-training expeditions and seminars, and boat buying consulting. We used his service to find Rocinante and learned a lot about dozens of blue-water boats along the way. Very helpful. Reasonably priced. Worth it. Mahina Expeditions Offshore sail training expeditions with John and Amanda aboard their Hallberg Rassy 46, Mahina Tiare III. Hurricane Island Outward Bound School – amazing opportunities for Vets and teens (and anyone, really). Adventurers and Scientists for Conservation Why not enrich your sailing experience by simultaneously contributing to real scientific research? Sailing with a mission. We love it! We participated in the ASC micro-plastic study and had a great time while learning a lot.